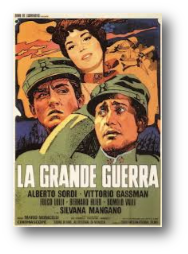 La Grande Guerra is a 1959 Italian film directed by Mario Monicelli. It tells the story of an odd couple of army buddies in World War I. The movie, while played on a comedic register, does not hide from the viewer the horrors and grimness of trench warfare. Starring Alberto Sordi and Vittorio Gassman and produced by Dino De Laurentiis, the film won the Golden Lion at the Venice Film Festival. Its crew also included Danilo Donati (costumes) and Mario Garbuglia (set designer). It was an Academy Award nominee as Best Foreign Film.